This is my polite nod to the fervent season commonly known as March Madness. 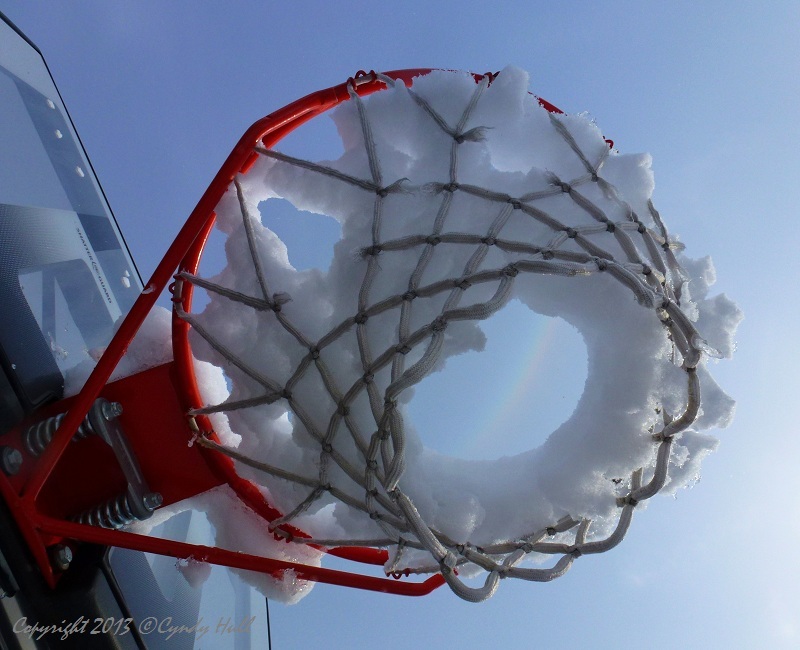 While taking this photo, I fixated on the patterns and failed to notice the tiny slice of rainbow perfectly framed in the hoop. Seeing it during closer review was so satisfying! Kind of in the way a thin sliver of real New York cheesecake is satisfying. Or that one little bite of someone else's dinner entree that is different from what you ordered. Sometimes you just need a tiny taste to be happy. That's me and March Madness - snippets of conversation gleaned in the lunchroom or from the radio announcer and I'm full on that topic! Alternately, I've observed that for those who are full-on into March Madness, a little slice will never do - they'd eat the whole pie, and ask for more. Are there Photography Angels? If yes - then one must have surely planted that sliver of rainbow! Too perfect!! !